We have lived through so very much, and almost none of it has been called by its right name." Westerners, of course, already possess mammoth accounts of the Soviet prison system -- the "Gulag Archipelago" of interrogation centers, transit camps, slave labor installations, etc. Here it is returned in a voice both different and familiar, a sarcastic, exclamatory, poetic, hyper-Russian voice. Among all the charts of convoys, arrest quotas, grotesque trials and torture, several things stand out. One is Solzhenitsyn's portraits of his fellow prisoners. Another is an account, adumbrated in his novels, of the regime's persecution of Soviet POW's during and after World War II. Finally there is Solzhenitsyn's now thumping anti-Bolshevism. Stalin, he thinks, simply followed "the beaten track"; already in Lenin's time the horrors were planted, he insists, viewing the Civil War and the early 1920's self-righteously rather than historically. 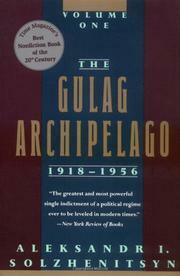 The book praises the mildness of the czarist prison system, again disregarding the context. And Solzhenitsyn's moving sympathy for the Russian soldiers who defected to Vlasov's anti-Soviet army is mingled with hints of political approval which have already engendered intricate, sizzling debate. This volume is only one third of the whole work; judgment on the shape and color of Solzhenitsyn's anti-Communism must await the remainder. Meanwhile, "I have come almost to love that monstrous world" of the Archipelago, he says -- it was more rial than ordinary secular life.